We’ve found a crop of 36 free non-profit webinars springing to life for the month of April! This month's round-up includes webinars to help non-profits grow support and bigger gifts; tips and tricks for seeking grants; non-profit CRM strategies; how data and volunteers can save the world; social media; non-profit tax law and more. In preparation for our release of Version 5, we are hosting a webinar to preview some of the exciting enhancements coming soon. This session will offer a pre-recorded video that will explain what's new in Version 5 of Wild Apricot, and how the upgrade process will work followed by a live Q&A. There is no doubt that visuals are driving online communications in 2014. Our minds react differently to visual content. On Facebook, videos are shared 12X more than links and text posts combined. 42% of all Tumblr posts are photos. On YouTube, 100 million users are taking a social action on videos every week. 36% of all shared links on Twitter are photos! Free or low-cost tools that do not require any technical knowledge to use! This 4Good webinar is all about how strategic donor-centered stewardship will improve your donor retention. This is big! If you can retain just 10% more of your supporters you can increase their lifetime value by 200%. Are you even measuring donor retention, or just dollars raised? The problem with the latter is that it can mask trends that could destroy your organization’s ability to sustain itself over time. One time major donors can zoom in and plug holes, but not forever. You need a solid, loyal base of supporters who stick with you through thick and thin. Hopping onto the expensive donor acquisition treadmill is a thankless pursuit. You’ll bring in new one-time transactions. But you’ll lose them again just as fast. So you’ll keep running and running on that treadmill, getting nowhere, until you actually start sliding back. Want to change this scenario? Want to get off the treadmill and march forward with confidence? You can, and you will. Get started with this webinar! This 4Good webinar will focus on using tested and proven human and technological tools, available to everyone, to meet agency life-threatening challenges from funders, media, and lawyers to renew the agency, safeguard funding, reinvigorate staff, and improve governance using lessons from three New England examples of successful interventions in major social sector organizations threatened with dissolution. What should be your first reaction as Board or staff when you open the newspaper and see your organization on the front page, and NOT with complements? What does a Corrective Action Plan look like? What's the proper role of the Board in a crisis? Why are core values important in a crisis and how do you re-discover them? Why is governance so important during these times? Technology trends are continuously changing and improving the way we work and communicate with each other. Staying on top of these trends is essential in developing new strategies for attracting, engaging, and retaining volunteers. Join the founders of Kindness Connect, Jonathan Burns and Kevan Osmond, in this CanadaHelps.org/MyCharityConnects webinar as they explore these changes and how you can best utilize new and affordable technology to maintain an effective and engaged volunteer program. Nonprofits looking for constituent relationship management systems (CRM) are often enamored by the features and bells and whistles. Successful CRM, however starts with strategy – how does your nonprofit go about achieving your mission? Review four common nonprofit CRM strategies and do a deeper dive into each. Discuss how your strategy influences selection, such as which features are most important. Look at implementation implications – does your strategy mean you can do it yourself or that you need to engage consultants, for example. This webinar is best suited for nonprofits and public library staff in the United States, but is open to participants worldwide. Crowdfunding Events: How to Drive Donations in One Day! Online Giving Days. Community Foundations are doing it. Higher Education Institutions are doing it and you can do it too! Organizations across the world have raised up to $25.8 million in one day, inspired up to $3.7 million in offline donations, and reactivated up to 60% of lapsed donors – all while significantly raising brand awareness. In this Network For Good webinar, using real-life case studies from organizations both large and small, Kimbia Vice President Lori Finch will show you how easy it is to leverage the multiplying effect social media has on online fundraising and the sense of urgency crowdfunding invokes in order to achieve your goals. In this session I will analyze an Executive Director's well-developed LinkedIn profile page, highlighting how/what you need to express why you and why your organization. We will go step-by-step from the top to the bottom, with my commentary, on what you want to include in your profile to make it the best it can be. A robust LinkedIn presence is a must if you seek to attract more businesspeople as volunteers, board members, corporate sponsors, donors or new hires. Record-keeping is not an exciting word, and inspires equally drab reactions from nonprofits who work to fulfill record-keeping and reporting requirements. But there's a secret many organizations are just beginning to discover: your data is the key to helping you fulfill your mission - and save the world. Join VolunteerMatch for this Nonprofit Insights webinar in honor of National Volunteer Week. Erinn Andrews of GuideStar and Lisa Pool of the Technology Affinity Group, who have partnered on the Simplify initiative, www.simplifynow.org, will share how data and record-keeping in the nonprofit sector is becoming so much more than just the IRS Form 990 - and why paying attention to this trend, and engaging volunteers to help you contribute, will help your organization get more funding and support. Why is nonprofit record-keeping important, and how is the GuideStar Exchange helping nonprofits do more with their data? How can partnerships like that between GuideStar and TAG (Technology Affinity Group), which resulted in the Simplify initiative, help nonprofits get more funding and support? How can nonprofits engage volunteers to help with record-keeping and making their information accessible? Do your board members talk to their neighbors, coworkers and family about your work? Do they ignite others to attend events, give time AND money? If you feel like you are pushing a boulder uphill to get your board members excited to share client examples or their own reasons for joining your board, you aren't alone. Why sharing stories is so important for retaining donors. How to help your board identify mission moments and turn them into a story. How to cause your board to WANT to share mission moment examples of your work. Two fun and easy storytelling exercises you can use over and over with your board, community volunteers and staff. Don’t let anyone else tell you otherwise -- email is the workhorse of digital fundraising. It may not be the sexiest of all things online, but email gets results. Now, think about it. Is your email fundraising program generating the best return possible? It’s been estimated that the average value of an email address is close to $15 per year – and that’s just calculating online donations. Plus, online fundraising continues its year-over-year double-digit growth rate. This CanadaHelps.org/ MyCharityConnects webinar will give you the 5 most important strategies for maximizing return on your email fundraising program. We’ll explore practical examples, pitfalls to avoid, best practices and share industry benchmarks so you can track your success. Unleash the potential of your email fundraising program and you’ll bring in more dollars online than ever before, and be the new star of your fundraising team. 7) it does not advance your mission. These problems are not inherent to strategic planning; they are signs that it has been done badly. This 4Good webinar will look at how a nonprofit can infuse its mission into the daily activity of staff and board through a straightforward, rigorous, and even morale-building process. It will offer both a structure and tools for planning. As a grant professional, you are perfectly positioned to help your organization plan strategically for its grantseeking future. You are the knowledgeable guide who can lead executive and program staff to design work that is attractive to grantmakers. In this webinar, we will discuss ways to "rally the troops" while staying calm, cool, and collected. Nonprofit tax-exempt organizations are subject to a complex array of rules that greatly restrict their activities and impose numerous organizational and operational requirements. Failure to abide by the rules can result in the imposition of unrelated business income taxes, excises taxes on individuals involved in running the organization, and even revocation of tax-exempt status itself. Unfortunately, the rules are incredibly complicated, difficult to understand, and not written in any one place – which makes compliance even more challenging. Fortunately, one of the nation’s leading nonprofit attorneys has agreed to answer your questions and help – in plain language – demystify this difficult area of tax law during this GuideStar webinar. Our speaker chairs the nonprofit practice at one of the nation’s leading law firms and is widely recognized for his ability to explain difficult nonprofit legal issues in a manner the layman can understand – something that is always welcome in the nonprofit world! Prior attendance at Proposal Writing Basics is strongly recommended. Savvy nonprofits all across the country are investing in social enterprise to build capacity and reduce their reliance on traditional (and shrinking) funding sources. Is social enterprise a good idea for your nonprofit? It just might be. Attend this fast-paced webinar to learn what social enterprise is (and isn't), dispel typical myths about social enterprise, walk through the 7 steps necessary to go from initial idea to business plan for earned revenue and see examples of social enterprises developed by organizations like yours. In this Nonprofit Hub webinar, you'll gain a better understanding for the social enterprise process, including how to perform market research and feasibility studies, sales planning, costing analyses and much more. With over 1 billion users, Facebook has emerged as a go-to place for understanding interests. With 250 million users, LinkedIn has established itself as a leading source for career information. Yet, these powerful networks continue to operate at the periphery of most non-profit fundraising organizations. This 4Good webinar will teach the principles of “Social Donor Management” and how institutions are investing in social media to transform its fundraising efforts and deliver a clear Return on Investment. This session will help your institution align social media with core advancement goals of increasing participation rates, identifying major donor prospects and improving stewardship. essential elements of any fundraising plan. There is no such thing as a single channel person. You, me, our donors, no one spends their days in just one channel or place or media. Which means we need to create campaigns that connect with our supporters where they are and in all the places they spend their time. Do you ever feel like the members of your team are rowing their own individual boats? Do you wish everyone on your team "rowed" in the same direction? Results-focused teams can take work - and they're worth it. When it comes to achieving your mission, a well-focused team, clear in its role with a strong sense of ownership, is an unbeatable force for positive change. Fundraising the SMART Way: Who’s Good Enough for You? Want to revolutionize your fundraising? Figure out which donors are right for you. Concentrate on the ones who give, advocate, and adore your nonprofit, its mission, and its programs. Avoid those DOA's - donors who are dead on arrival - who make you sorry you won their gifts in the first place. Sounds easy, right? So why do the data tell us that more than 65 percent of development professionals report that they lack documented criteria for qualifying prospects, and investing time in those with the highest potential for donor lifetime value? Documenting your qualifying criteria, your ideal-donor profile, is one of the most dramatic and productive things to do if you want to revolutionize your fundraising. Your SMART Way Prospect Scorecard goes way beyond conventional criteria about wealth profile and giving history. It also describes your best funders' qualitative characteristics, their motivations for giving, and even shows you where their "danger signs" may lie. In this second 4Good webinar in our series Fundraising the SMART Way: Why We Need a Fundraising Revolution, we'll show you why the Scorecard will buy back time you'd otherwise squander trying to win over the wrong prospects, and how you can start the process of building your own Scorecard, the one that will be unique to your nonprofit organization. Google Analytics is a web analytics tool that allows website owners big and small to monitor activity on their site. In this CanadaHelps.org/ MyCharityConnects webinar, Kathryn will share the fundamentals of Google Analytics and how to use the data to better understand the way users interact with your brand online. Topics range from getting GA setup properly on your site and basic navigation to understanding traffic sources and tracking conversion goals. Whether you are interested in making more informed marketing decisions or simply want to better understand visitors to your site, Google Analytics, and this session, are for you. The presentation will be followed by 15 minutes for questions. 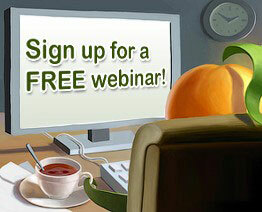 If your organization offers a free webinar that would be of interest to non-profit, membership or volunteer-based organizations and you want to include it in next month's post, please email a brief overview (like those above) to lori@wildapricot.com no later than April 18th.